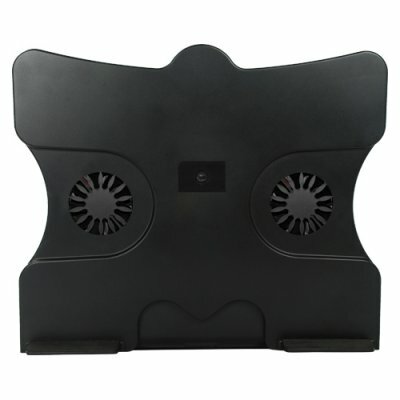 Successfully Added Adjustable Laptop Cooler Pad with USB 2.0 Hub to your Shopping Cart. Adjustable Laptop Cooler Pad with USB 2.0 Hub. Top-grade laptop cooler pad with stand, the perfect accessory for every modern notebook computer. Give your notebook computer a little TLC with this laptop cooler pad that connects with a simple USB lead to your computer. Are you tired of constantly leaning forward to use your laptop? With this laptop cooler pad you can more comfortably use your computer while sitting on the couch or laying in bed. Simply adjust the laptop/notebook cooler pad to the angle that makes you most comfortable and you can enjoy working on your computer while being more relaxed. This laptop cooler pad comes with a built-in 4 port 2.0 USB hub and two cooling fans that will dissipate heat away from the bottom of your notebook and keep the computer cool for better performance. This is a very handy accessory which fits nicely in your carrying bag and makes a nice gift for yourself or any friend that has to use their notebook computer frequently. Provided with an M.O.Q. of two pieces, order this item and get one for yourself and give another as a gift to a friend or resell on eBay for fun and profit!